I know ya'll are excited to see the set we are featuring today for the December 2014 Papertrey Ink Countdown. It's all about hugs. Big, cozy, loving hugs. Of the papercrafting variety, of course. Because, if you think about it, that is what homemade cards *really* are anyway. They are a way to send a hug in the mail to those that you love when you can't be there. So it seems fitting that we can now label them as such. You know...aren't we just finally calling a spade and spade? :) And in such a wonderful way. 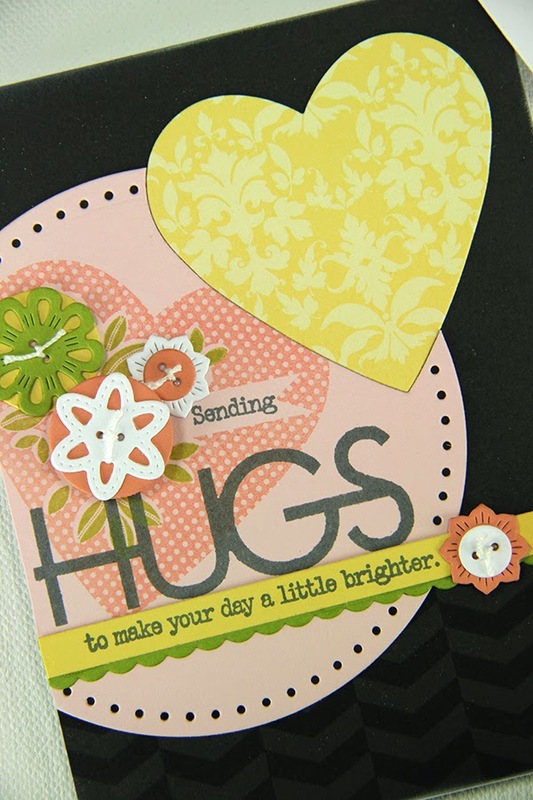 What is so great about the Big Hugs Collection are that the five large stamps that say "hugs" in a variety of fonts are also offered as dies. So many options. 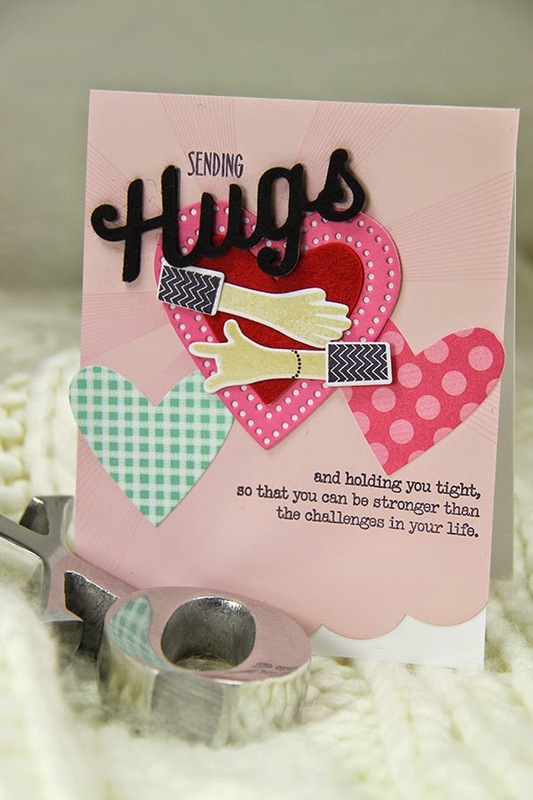 This card uses a stamped "hugs" from the set and is completed with the rest of the sentiment. I layered it over the floral heart from the With All My Heart set. There was room on the heart stamp for the word "sending" so I could seamlessly use the two stamp sets together. Here's a close up of all the details. A few things to note. The Harvest Gold strip of paper and the Simply Chartreuse scalloped border underneath are cut using the Hello There dies. 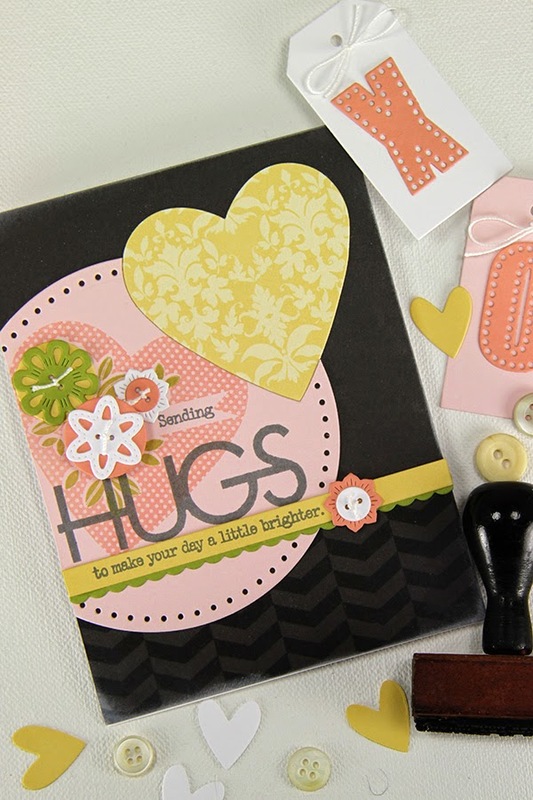 Adore how easy this look is to create because these dies are cut to 4.25" in length. Also, the heart stamp you see here (from With All My Heart) has additional stamps to layer in a floral cluster in the design. I opted to do something different by die cutting various Button Stack dies instead. With so many size options in the button dies, I was able to fill the openings in the stamp rather well, allowing the leaves to show as intended. Limitless Layers Hearts was cut into a Stitched Circle Dies for a inlaid die look. And BB: Diagonals gives some depth to the background. 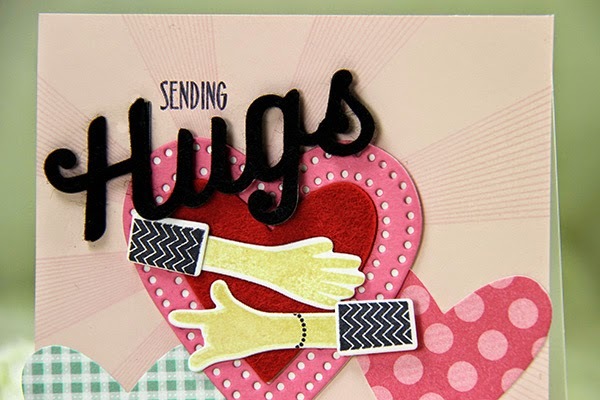 Next up, I'm using a die cut "hugs" on my card design. When I think of hugs, I think of the words "cozy" and "comforting". With that thought, my word "hugs" and the Pure Poppy heart are cut out of PTI felt. A quick tip for working with intricate die cuts made out of felt. Die cut a matching cut out of cardstock. Glue your felt cut to the paper cut, so you can maintain the shape a bit better. The paper cut will guide you. This also makes it easier to glue the felt to your card or project. And speaking of hugs, how about Lexie's Give Me a Hand set? Is it not the best way to wrap up the large heart created by Limitless Layers Heart Stitches? It looks like a hug! Fabulous. That's it for me today. I hope you like this set as much as I do. Only a little bit longer to wait until you can get your hands on it. Big Hugs and the rest of the December release will be available on Monday night at 10 PM EST right here. Love the thought behind 'Holding You Tight'! So many times you want to pass your strength over to a friend who needs it more than you and what better way than with a hug? Thanks for sharing that! Fabulous. Love how you have paired the arms holding the heart with that encouraging sentiment.